Buying used rigid inflatable boats (RIBs) can be an enjoyable or stressful experience depending on how you approach the endeavour. 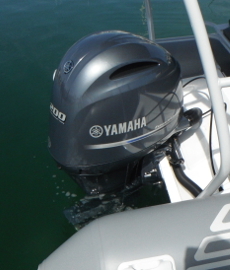 A thorough inspection before buying can give you peace of mind and years of fun on the water with some reassurance. This guide was put together to help you through this process so you know exactly what you're getting. This can be quite an inconvenient and time-consuming process, especially if you're new to boating. 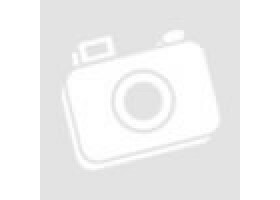 West RIBs offers pre-purchase inspections by one of our qualified professionals. We provide you with a comprehensive written report detailing everything you need to be aware of and can provide a quotation for any repairs, modifications or extras. Please give us a call if you'd like to organise this. Which RIB is right for me? The first step should always involve asking yourself: What do I want to do with my boat? RIBs have progressed from the utilitarian 4x4 of the sea, initially developed for rescue and military use. Today the recreational use of RIBs is well established. The massive inherent buoyancy, low centre of gravity, and high power to weight ratio has made today’s RIBs thoroughbreds of the sea. 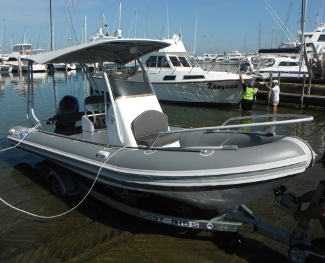 The RIB can be an extremely fast, safe sea boat, when properly handled, and can be seen as runabouts, rescue lifeboats, fishing boats, luxury tenders, dive boats, adventure craft, race and cruising boats. RIBs are often specialized or can be customized to suit your purpose, so what you buy should be largely determined by how you will enjoy the water. It's important to find the right boat to fit your activities, tastes, and the needs of your passengers. Take the time to do some research and talk to the experts for advice. Used trailers can be in poor condition due to their frequent immersion in salt water, so it's a good idea to thoroughly inspect them before buying or towing them. Brakes - not all trailers require brakes, the heavier the boat the more stopping power is required. If mechanical brakes are fitted, check their operation by releasing and re-applying the hand brake on a slight slope. Visually check all linkages, cables, discs and pads if possible. Some surface rust can be expected due to regular immersion in salt water. Electronically operated brakes require a brake controller unit to be installed in the towing vehicle to test the unit. If possible get them to tow the boat around the block to show the brakes are operating. The activator units of electric over hydraulic can be troublesome and are fairly expensive to replace, unlike brake discs and pads which are relatively inexpensive. Bearings - throughout the life of a trailer, the bearings will need to be changed multiple times. Jack up the trailer and try to wobble the wheel, checking for play in the bearings. Rotate the wheel and listen for sounds that may indicate worn bearings, it'll usually present as a screech or rumble. Always carry a spare wheel bearing when towing for long distances and the tools you need to change them, or even better a full hub assembly for a quick swap over. 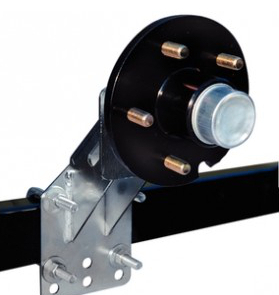 These can be mounted on the trailer utilising a bracket and often carry the spare wheel and tyre. A good tip is to check how hot the hub is after towing the boat for about half an hour. If it's getting hot to touch, there is a problem. Grease over the wheel is another indication of a bearing problem. Chassis & suspension - biggest issue here will be rot, check for chunks of rust and holes in the chassis especially on the underside of the trailer. Have good look out for worn leaf springs or hangers. 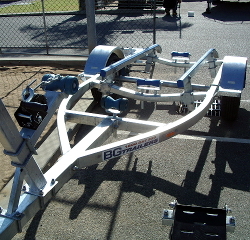 Check the boat sits on the trailer correctly and all the rollers of skids are in contact with the boat's hull. If the chassis is rotten then budget for a replacement trailer. The engine is the most complicated and expensive asset on a boat. We highly recommend you have this one looked over by a professional. Start with removing the cowl and looking at the engine's general cleanliness. A clean engine is a good sign of a responsible owner. Inspect the engine for signs of corrosion or damage. Check for wear in the swivel bracket and engine mounts by attempting to shake the engine, RIBs put huge loads on the engine mountings and suffer from this type of deterioration if the engine has not been properly checked and fittings tightened regularly. Ask to see a service history. The service history will tell you a lot about the maintenance and mechanical history of the motor. Larger modern engines these days can be connected to a laptop and from downloaded reports, show any faults, alarms or other diagnostic information, including engine hours. Check the skeg for wear and damage. Again a good indication of how the owner has treated it. Spin the propeller to ensure that the propeller shaft is not bent - this can also show as vibration during a sea trial. The steering usually cable or hydraulic on RIBs with centre consoles. Check the free movement of all cables, it’s not uncommon for steering cables to seize. Not an expensive part but sometimes fiddly and time consuming. Check condition of all fittings to steering box and engine. If hydraulic steering, check the oil level and look for leaks. Move steering and check for ‘play’ while listening for clicking in the helm, which can indicate it is low on oil. Inspect the hull for cracks, chips and grazing, in particular along the spray rails and chines. Hairline cracks running across the beam of the hull and any longitudinal cracks are the principal elements to look out for. Either of these could indicate substantial internal damage. Minor grazing, small star cracks (stress) emanating from pressure points and chips in the chines may detract from the boat’s appearance, but are usually superficial and require a relatively easy and inexpensive repair job. Check the transom around its base and its bearer’s knees. Minor cracks in both the base and at the top of the knees can be common, but generally do not indicate major damage. Nevertheless, check carefully. Also look for cracks along the top edge of the transom, major cracks here could indicate delamination and water ingress, which may require the removal of the engine and major repair costs. Look for any major repairs done to the buoyancy tubes by checking for half stuck patches as they are a good indicator of an amateur repair job and consequent hidden dangers. Such patches should be attended to as soon as possible. Check for previous repairs to the tube attachment, usually spotted by glue stains. Pull at the fabric, to check that any gluing has been carried out properly. Make sure the seams are in good condition as they're a common point of failure on RIBs with questionable build quality. On some RIBS, the tape covering a seam a simple protective layer that can start to lift or become totally detached, while on others it's the main attachment. For the latter, this can entail an expensive repair job. The RIB should have multiple independent air chambers, to check the baffles (the division between air chambers) deflate one tube at a time and inflate the other to its normal operating pressure: 1.5 to 3.0 psi. With your ear pressed against the tube, you should be able to hear air leaking from one chamber to the next, or leave it overnight to see if air bypasses the baffle. Be very careful when considering a RIB with painted tubes. Sure, they look fantastic when freshly painted, but the paint can cover general wear & tear, UV damage and unsightly glue from repairs. This makes it very difficult to determine the true condition of the boat. You may also want to consider how much the paint will impact its lifespan when repairs are required in the future. If we had to choose between two equal RIBs; one with painted tubes and one without, we'd pick the unpainted RIB every time. If you're after a change of colour or additional protection for your RIB, we highly recommend having custom tube covers made. Made using high quality marine grade fabric that provides excellent protection against UV, scratches and punctures. We can make them in any colour you'd like, or even with your business' logo on them. Starting with the batteries, look for any rust on the terminals and connections. Batteries don't last long once the salt get to them. Ideally they'll will be marine grade and in a marine grade battery housing. Good owners will even go so far as applying a wax sealant and lubricant to the terminals regularly. We recommend replacing your batteries every two years. Look for the switch panel and start powering everything up, one by one. Depending on the size and use of the RIB you may have navigation lights, electric bilge pump, fish finder, radio, GPS or even a stereo system and speakers. Test them all out and see if they're working properly. The anchor must be of a type that will hold in all seabed conditions and with enough line to suit the depths in which you usually operate. A minimum of 30 metres (inshore), 50 metres (offshore) of line with 5-10 metres of chain is recommended. Here in Australia, EPIRBs are required to register with the Australian Maritime Safety Authority, also known as AMSA. So if an EPIRB is included as part of the deal, be sure to have the device deregistered at the time of sale by the previous owner. Fire extinguishers are only required for boats with an inboard engine, but are still highly recommended. Check that the pressure gauge and expiry date are within their parameters, and that there is no major rust that could impair its use. Dry powder fire extinguishers should be shook regularly. No matter how genuine the seller seems, you should check the history of the boat to make sure it’s not stolen, encumbered by an outstanding loan, or even a previous write-off. Get the boat’s HIN number and check against the databases in the state in which it’s registered. For a small fee (free in some states), this simple step could save you a lot of money and problems. Make sure all the paperwork is in order, and that you have original versions (never photocopies) of everything, this includes registration papers, service history and trailer registration. If you’re making a payment or even just a deposit, get a receipt and make sure the seller’s full details are on it. Just as you would take a car for a test drive before buying, you also should not buy a boat without first testing it on the water. If you're new to boating, bring a marine surveyor or experienced friend along. It also helps to bring a checklist of inspection points and questions along with you as well. When taking a boat for a test drive, it's important to make sure the engine was not warmed up prior to your arrival, and also try and make sure that you run the boat long enough to rule out any danger of overheating as well. Before you set off, turn the steering wheel from one lock to the other to make sure there is no screeching, banging, or knocking. Check inside the bilge and locker for water entering. See how the boat responds to variations in speed, turns, and wave angles. Listen for strange noises from the engine, and don’t let the seller distract you by talking or turning up the radio. Once the engine has warmed up to its operating temperature, use its full range of power. Check operation between forward and reverse, remembering you have to hesitate when going through neutral, listening for any excessive clunk or crunch when switching between them. These sounds can indicate gearbox problems. Buying the wrong boat is more common than you might think, even amongst experienced buyers. Not having something large enough for your purposes is a potential problem for someone on a tight budget. Here in Western Australia, Rottnest Island is a very popular destination for boat owners, but many are not aware of the regulations requiring a boat with a minimum size of 4.5 meters - which are in place for good reason. It's dangerous to take an undersized boat too far out to sea. How many passengers do you expect to have on board at any one time? 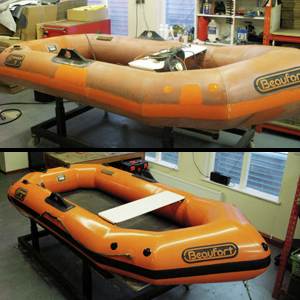 While RIBs can comfortably seat a lot of passengers thanks to their inflatable tubes, they'll still have a passenger limit specified by the manufacturer which you can find printed on the builder's/complicance plate. Buying on price alone is the wrong way to go when it comes to boats - boats are inherently more expensive than cars. Along with all the tips we've listed above, you'll want to consider manufacturer and local support for the boat you're buying. Are parts easy to find? Are the local repairers and dealers familiar with the brand? Cheap Chinese made RIBs generally have poor build quality, have shorter life spans, cost more than they're worth to fix and have very little resale value. Resale value is an important factor to take into consideration. Probably 5 to 10 years down the line, you may want to trade in your boat for an upgrade. Whether you choose to sell it yourself on a used-boat website or trade it in at a dealer, you'll want to know how much money you can expect beforehand. Manufacturers with a long history will make things easy as there'll be a lot of their boats out there in a big range of ages. Want to test a RIB and experience the fun for yourself or just find out more?